Vibrant organic red potatoes, chock full of nutrients. We grow our potatoes slowly and choose the varieties for the best flavour. 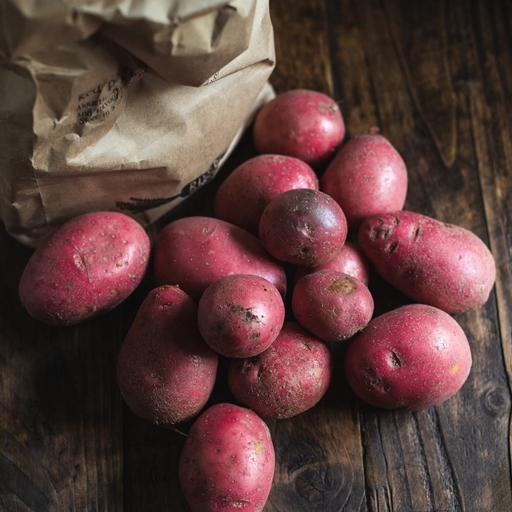 These red potatoes make for smooth, creamy mash, crunchy roasties and lots more besides. Layer with cream and garlic for potato dauphinoise, grate and fry into golden latkes or transform into fantastically crunchy roast potatoes. Mash your leftovers with grated beetroot or cooked greens to make brightly-coloured bubble and squeak. Or dice cooked potatoes to make a hash with greens and a little chorizo or corned beef. Keep in the paper bag we deliver them in, somewhere cool and dark.